Peschiera is located at the southeastern corner of Lake Garda at the end of the Mincio river. The Milan-Venice motorway runs just to the south of the town and the fast main road connection to Verona and Affi is easily reached from the centre. The town has a popular railway station and is close to Verona. Peschiera is located near the junction of the north-south Brenner-Verona motorway and the east-west motorway which stretches from Venice to Milan, thus making it an excellent travel option from all directions. 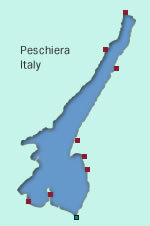 Drivers arriving from the east or west will be using the A4 motorway, which passes close to Peschiera. Those arriving from the south will probably filter onto the same motorway at Verona, while those arriving from the north (Germany, Austria and the South Tyrol, for example) on the A22 motorway are best advised to leave the motorway at Affi and use the SS450 dual carriageway and then the appropriate approach road to Peschiera. With its excellent surface transport connections, Peschiera has great access to all of the major airports in northern Italy, as well as some of the smaller ones which are served by the cheaper air travel operators and travel companies. Those arriving from outside Europe or from countries with fewer large airports should check Venice (Marco Polo) Airport and the two airports at Milan to see what the scheduled services are like. More travel companies and some of the cheaper airlines are using Verona, which is a dream arrival location for Peschiera. The towns in brackets are the closest well-known destinations to the airport. Peschiera's railway station is located just outside the centre of the town and acts as a transport hub for other resorts on the southeastern side of the lake with its services to Verona and Milan. The services to nearby Verona are also of interest to shoppers and day trippers - the express services take under 15 minutes into the Porta Nuova station of Verona. The train station is situated to the east of the centre and there are a number of hotels and guesthouses in the vicinity.